A wasting away of tissues; also known as phthisis or consumption. It is an infectious caused by a caused by a bacterium, mycobacterium tuberculosis. 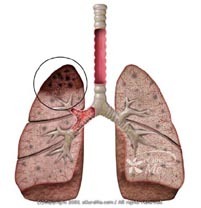 Organ or part of body involved: Lungs (usually) but may spread to other tissues and organs. Symptoms and indications: There may be few or no symptoms in the early stages. Later, serious symptoms may develop, including fever and copious sweating (especially at night), wasting, with loss of appetite and weight loss, malaise and tiredness. As the disease progresses, chest pain and a cough occur, then bloody sputum accompanies the cough. Causes and risk factors: Tuberculosis is contracted when a person breathes in droplets containing Mycobacterium tuberculosis organisms that have been coughed or sneezed into the air by a person who is infected with the bacterium. Tuberculosis is contagious, especially for persons living in crowded conditions. Also highly susceptible to this disease are those who are undernourished, in poor health, or living in poor urban areas, as well as the very young, and the very old. Prevention: Preventive measures include strict standards for ventilation, air filtration, and isolation methods in hospitals, medical and dental offices, nursing homes, and prisons. Infected persons need to be identified as soon as possible so that they can be isolated from others and treated.